I was lucky enough to receive the GAME GOLF digital tracking system as a Christmas present from my wife. Having now played a couple of rounds with it I thought I would share my thoughts. For those that don’t know GAME GOLF is a wearable system designed to track and display your golf game. At its heart it provides you with an electronic scorecard and record keeping system for every round of golf you play. It makes it easy to see playing strengths and weaknesses and as such is a good guide for future practice and training. In summary it is like having your own PGA Tour ShotLink software. It also has a social aspect which some users may find beneficial. Data can be shared with other users and other players can be followed or challenged. I believe their are some privacy settings if you don’t wish to share your data publically. Further enhancements to the system and how it can used are also expected during 2015. GAME GOLF was developed in 2013 by Active Mind Technology Inc, a company founded and led by Irish businessman John McGuire but based in San Francisco. The PGA of America and the Golf Channel are both financial backers. It was formally launched at the PGA Golf Merchandise Show in Orlando in January 2014. It is endorsed by Jim Furyk, Graeme MacDowell and Lee Westwood. Whilst providing some marketing credibility this is largely irrelevant for me. These guys don’t really need it, clearly have the benefit of Tour stats and analysts and any challenges against them are illusionary at best. Having said that using some golfers from the Ladies and Seniors Tours may have been more beneficial for the company. The product also received invaluable publicity last summer when President Obama was seen using the system on holiday in Martha’s Vineyard. Pictures and comment on GAME GOLF were inevitably seen all over the world. 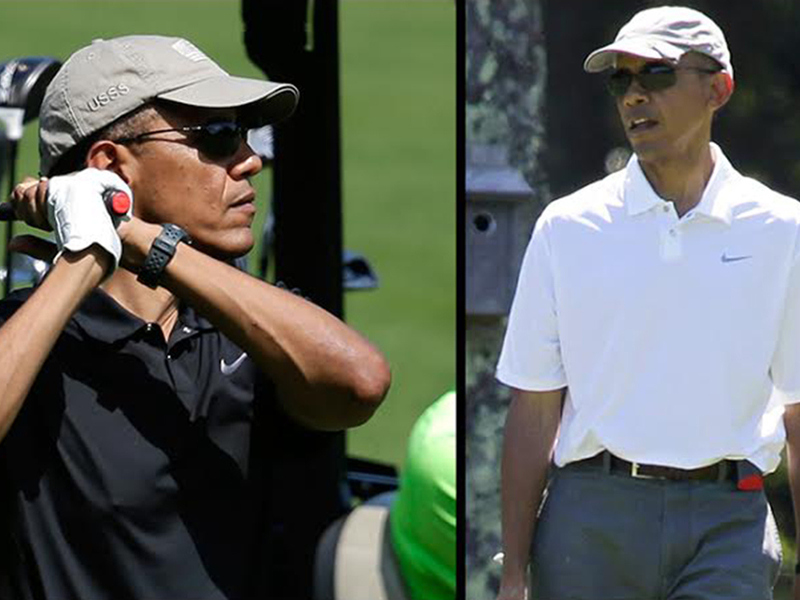 Interestingly the system wasn’t seen on the President’s clubs in Hawaii during his recent winter break. The system appears to be doing very well and proving popular with golfers. It is now being used in around 80 countries and well over 10 million shots have been recorded and logged to date. GAME GOLF currently has a recommended retail price of £159.99 in the United Kingdom. In the box you get a small tracking device, 18 club tags, a USB cable and a protective pouch. The tracking device contains both GPS technology and motion sensors. Step 1 – you screw one of the red tags into each of your clubs. The tags are marked on the top. Assuming you carry 14 clubs you therefore have 4 spare tags. Step 2 – you then log onto the http://www.gamegolf.com website to create an account (i.e. e-mail address, password, home golf club) and set up a digital golf bag to match the red tags added to your clubs. The tags perfectly matched my 14 clubs so this was effectively pre-loaded for me. Step 3 – download the up to date software to your computer and tracking device using the USB cable. This also charges the tracking device. The software has over 30,000 courses loaded into it. Steps 1-3 took me about 15 minutes and was straight-forward and intuitive. 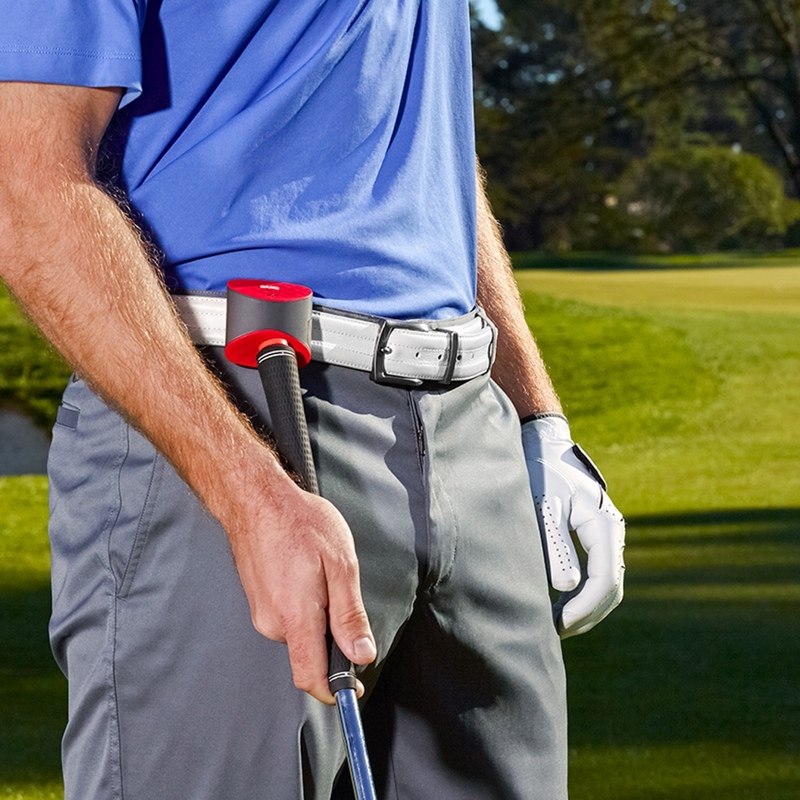 Step 4 – at the course you turn on the tracking device (making sure your location has been picked up) and attach it to your belt. To record each shot the top of the club used is pressed against the bottom of the tracking device at the spot it is played (see photo below). This can be done either before or after the shot is played. Whilst a little conscious of this to start with it has quickly become a part of my pre-shot routine and has not proven to be a burden to my enjoyment of the round. Neither the tags or the tracking device interfered with my swing in any way. It grates a little on the greens where obviously short putts also have to be recorded. However, this may have more to do with my putting than the system ! Once the round is completed the tracking device is removed, turned off and stored in the pouch. Step 5 – once home you open up the website and upload the round information from the tracking device to your computer using the USB cable. Before finalising and ‘signing’ the round off (sadly after which no further changes can be made) you are able to amend and delete and erroneous or missing shots. Having got on ok with the device on the course this was the next big test for me. How accurate would the data be ? I am pleased to report the information provided was pretty good. My home club had been found and the data recorded satisfactorily – not perfectly. On one of my rounds an extra shot had been added to two holes where I had gone ‘off piste’ and had ‘tree trouble’ – more my fault than the system’s. The review system enables you to amend the data shown so it doesn’t take long to get your round accurately shown. All I have needed to do beside delete a couple of extra shots is clarify putts taken off the green. After all I don’t want my real putting stats to be impacted by my use of the putter from off the green ! I know many users find the fact that signed rounds can’t be amended frustrating, particularly in their early days when they are still getting used to the system and even after careful checking still end up submitting a round with an error or two. Hopefully, GAME GOLF will enable changes to signed rounds to be made in the future. Step 6 – you are then free to explore and interpret the data as you see fit – see below. Obviously the more rounds you play and log the better the data quality. Step 7 – Optional – you can download a mobile App to access your data on the move if you wish. An iPad-specific version is still awaited but I assume must be coming down the line. What information is available to me ? a) ‘My Rounds‘ – lists your loaded rounds and headline stats for each, namely, Fairways Hit, Greens In Regulation (GIR), Putts/Hole, Scrambling and Sand Saves. I haven’t found it easy to record bunker shots so far so my sand save stats are non-existent. b) ‘Explore‘ – enables you to access recorded scores at each course, review other players statistics and compare your performance with that of others. c) ‘Insights‘ – It includes ‘Off The Tee’, which analyses tee shots by club and by round, ‘Approach The Green’, which highlights GIR stats by club and distance, ‘Scoring’, which shows round, par 3 and putting data, and last but not least, ‘Club Performance’, which highlights each shot with each club in the bag, thus providing clarity as to distances hit. This is where the real value of GAME GOLF lies. I found the data provided both interesting and helpful to my game improvement thinking. Importantly it has confirmed beyond question my club distances. d) ‘Challenges‘ – enables yo to participate in challenges and competitions against other users. Not of particular interest to me but will be welcomed by others. Are there any limits on when and where I can use it ? No. Both the USGA and R&A are supportive of the system and have confirmed it can be used in all competition play. Some pros have already been seen to use it on the PGA Tour. This is not surprising as the system provides no on course information. So in conclusion I love golf and am not immune to a gadget or two so GOLF GAME is right up my street. This system is quite expensive but I believe the price is justified when one considers the GPS technology and motion sensors in the tracking device and the course data and analytical software that it provides and uses. I found it easy to set up, use on the course and ultimately upload and access my performance data – and I am no IT expert (as the website shows !). I also like the presentation of the information, particularly the ‘Off The Tee’, ‘Approach The Green’ and ‘Club Performance’ options and screens. For some the effort involved, which can be a minor distraction during play for both you and your partners, may not be worth the trouble. A barely audible beep also goes off when a shot is tagged which some may not like either. In my opinion it’s use did not slow down my play or that of my group. Of course some people won’t have or want to make the time to input and amend their scores, after all playing golf already takes a long time. At the same time if you don’t have the time or inclination to practice then one may consider the stats. of little use. I feel GAME GOLF has added something to my enjoyment of the game. It is focussing my mind on every shot and certainly creating a talking point on and off the course. I now benefit from accurate and objective statistics and can use these to better focus my practice and strategic approaches on certain holes where I am consistently under-performing. I was a little late to the use of GPS watches for assistance with distances but now wouldn’t be seen without my Garmin Watch on the course. Whilst it won’t be for everyone GAME GOLF is in my view a welcome addition to the golf accessories market. I am sticking with it and as such recommend you look into it too and give it a go. This entry was posted in Golf Miscellaneous and tagged GAME GOLF, GPS technology. Bookmark the permalink.